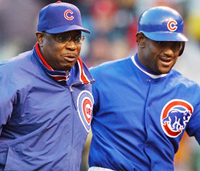 As manager of the Chicago Cubs during the 2003 season, Dusty Baker had a front row seat for Sammy Sosa’s history making 500th home run on April 4, 2003. “It was like déjà vu,” said Baker, who watched Sosa’s historic long ball from the visitor’s dugout in Cincinnati. “Sammy hit No. 500 at the same time of the season and in the same city that Hank (Aaron) hit 715 and I was here for both of them," said Baker who was on deck in April 8, 1974 when Aaron hit home run 715 to pass Babe Ruth in career home runs. It’s a historical fact (view video) that he was only a few dozen feet away from Aaron (standing in the on-deck circle, when “Hammerin’ Hank” broke Babe Ruth’s record. In this photo you can see as Baker (#12) is in the front of the crowd awaiting Aaron at the plate after his historic homerun trot. Baker also watched from the San Francisco dugout as Barry Bonds bashed his way through the 400, 500, and 600 home run barriers. A few years ago, a reporter asked Dusty Baker, who was on deck 35 years ago when Henry Aaron hit his 715th home run, if he said anything to “Hammerin’ Hank” before he stepped in against Los Angeles pitcher Al Downing on April 8, 1974? "Hammer? You didn't say too much to Hammer. 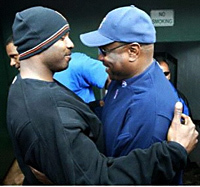 He talks to you," Baker said of his Atlanta Braves teammate. "I was 22, 23 (years old). He told me he was going to get it over with. He told me he was going to hit [Downing's] slider over the left-field fence and I said, 'OK.' And he hit it over the left-field fence. "After a guy does it for a while, it's kind of like Muhammad Ali, you just accept he's going to knock this guy out in the third round," Baker said. "He told me he was going to get it over with now and this is it. And I said, 'OK,' and that was that." Baker did raise his fist when Aaron connected and the ball took off over the left-field wall. "I knew it was gone," he said. "It was a beautiful night." Aaron is definitely a hero to Baker, who grew up idolizing his and then played with him in the Majors. "I used to be Hank Aaron when I was a kid sometimes," Baker said. "I remember going to the Coliseum (in Los Angeles) when I was a kid with my dad and he took me to see the Braves. I think (Aaron) hit two home runs that day, Eddie Matthews hit two and Joe Adcock hit three. And there I was playing with him a few years later, beside him. 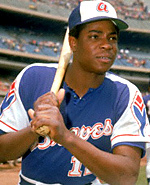 A 26th-round pick in 1967 by the Braves, Baker was closer in age to Aaron's children than to Aaron. "He was the reason I signed (to play professional baseball)," said Baker, who was considering going to college. He asked Aaron for advice, and he opted for baseball. As a rookie, Baker received this compliment from none other than Hank Aaron. "Dusty Baker has more potential than any outfielder I've seen in all my seasons with the Braves." Living up to that potential and Aaron’s example would be a lifelong quest for Baker. "He was a symbol of black America at that time, of excellence,” Baker said.